I was playing around with the settings, trying to get drag&drop to work, and now Synergy doesn't work at all. 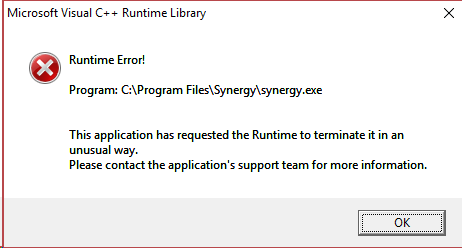 When I press the "Start" button, it keeps saying "Synergy is starting", but it never changes unless I press "Stop". Same on both server and client. Both PCs' logs complain about not being able to connect. Service seems to be running on both PCs. Both are Windows 10 x64, server's a desktop PC, client's a laptop, both using Ethernet. You can try stopping the service manually first and then restart it. Tried that, didn't help. Rebooting doesn't help either. Edit: I just had to toggle SSL back and forth and restart Synergy as admin, then it worked. Client is still saying it's "starting", but it seems to work regardless. Still can't drag&drop, though. Hi @Samuel Tønnessen. After you have connected your machines through Synergy, did you close the Synergy interface by clicking the x button? It could be better If you hide it instead of closing it entirely.